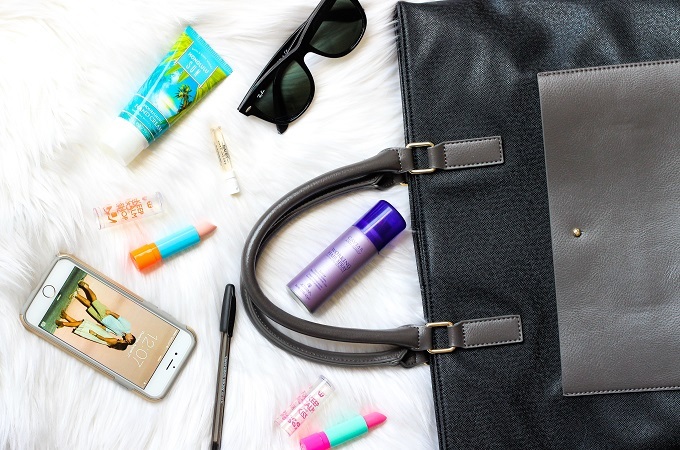 Love, Shelbey: What's in my bag? I just picked up a new fall handbag (Style "JF Blissful" from JustFab) and managed to do some serious de-cluttering. I thought today would be the perfect time to share a fun "what's in my bag" post. In all seriousness, I have every intention of keeping my bag clean. However, it seems that as we get deeper and deeper into a season, that mindset turns into "forget it - I'll just have crap all in my purse". These are a few items that are always necessities for me, no matter what purse or how messy it may get! Sunnies - I always keep a favorite pair of sunglasses on hand. I love the classic black style of my Ray Ban Wayfarers. They match anything and can adjust to any season! Sample Perfume - It's no lie that I'm a shoppping addict. I'm always getting free sample perfumes as a part of my online orders. I love keeping these in my purse for fragrance touch ups or if I forget to spritz my favorite scent on me before heading out the door. Hair Spray - Now, I have to admit, I don't generally use much hair spray but it's pretty much a safety blanket for me (for those sucky fly-away moments!) I keep a mini bottle of whatever hair spray I have on hand. I'm currently using the Alterna Caviar Hair Spray. Cell Phone - This is pretty obvious (other than a wallet) who doesn't hit the road without their cell? Pens - When I was in college you could find up to ten pens and pencils at a time in my bag. Now I try to keep it reasonable with one or two. You always end up needing them for something. Hand Lotion/ Anti-Bacterial Spray - I keep lotion in my bag mainly for other people. I don't really like the texture of it on my hands so I generally opt for a anti-bacterial spray. Lip Balm - Anyone who travels without a lip balm is MENTAL! I mean, I guess I have to give you kudos if that's the case but coming from someone with chronic dry lip syndrome, it's a suicide mission leaving the house without it. 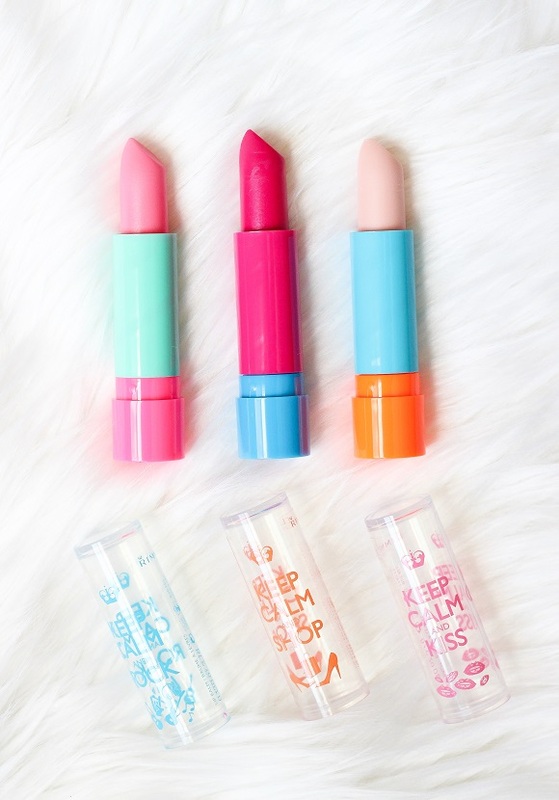 Rimmel just released these adorable "Keep Calm and Lip Balm" moisturizing lip balms with a hint of tint. I like to keep a clear balm like the Rimmel Keep Calm and Shop Balm on hand at all times. There's also a good chance you'll find some balms with color in my bag as well. I love the two shades featured above: "Keep Calm and Rock" and "Keep Calm and Kiss". You can find all 6 shades at Walmart. For $2.50 a piece, you may just want to scoop them all up at once! You can also check out this this sweet video to get $1 off when you buy two Keep Calm and Lip Balms! Don't forget to share your #KeepCalmLipBalm moments to be featured on the Keep Calm gallery page! What's your favorite Keep Calm and Lip Balm shade? *Thank you to LunchBox for sponsoring this post! As always, all opinions remain my own. Lip balm and sunnies are a must for me! I always have to have sunnies with me, my eyes are so sensitive! Love the bag!